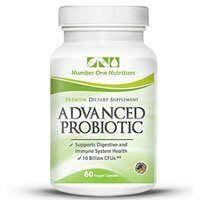 Overall, at 3.5 out of 5 stars, Number One Nutrition Advanced Probiotic is a slightly above average probiotic. There are a handful of things that I really like about this probiotic but also some things I wasn’t too fond of. On the positive side, I like that there’s a good range of probiotic strains, 7 in total with 11.5 billion CFUs per serving. This makes Advanced Probiotic a good contender for a daily probiotic and may potentially boost immune and digestive health. I also like that it doesn’t directly contain any common allergens in the veggie capsules, however it’s produced in a facility where it may be exposed to certain allergens. So keep that in mind if you are severely allergic to any particular ingredients such as wheat, soy, milk, or nuts. This probiotic comes with a child lock on the lid of the bottle. This is something that I‘ve never seen before and was impressed that the product went the extra mile to potentially keep children out of harm’s way. Kudos for that! This probiotic is NOT safe for children under 18 years old. I was a little wary at this statement because a lot of probiotics say they aren’t safe for kids 3 and under or kids in general. I was worried as to why this particular product isn’t safe for children 18 and younger or if they were just being extra cautious. Another big dislike of mine is the high price tag of $39.99 for a 1-month supply, which is definitely above the average. You also have to take 2 pills a day and the live cultures are only guaranteed through the manufacture date. Overall, I do think this is a good probiotic but I’m not sure if it’s worth the hefty price tag. Number One Nutrition Advanced Probiotic contains 7 probiotic strains with 11.5 billion live cells per serving (2 veggie caps). Of note, I like the use of Bacillus subtilis in the probiotic strain profile. This probiotic was present in the 1900s before antibiotics came on the scene and was used as an immunostimulatory agent in regards to helping aid in urinary tract infections and gastrointestinal diseases. I also like the addition of Lactobacillus rhamnosus. This probiotic strain has been researched to show a great range of potential benefits. Some of these may include severely reduced allergic reactions to peanuts, prevention of diarrhea, and the shortening of respiratory tract infections. Lactobacillus rhamnosus may also help with anxiety, increased weight loss while dieting, and reduced symptoms that come along with Irritable Bowel Syndrome. Advanced Probiotic does fairly well regarding allergy concerns. Other than the probiotic strains, the capsules only contain vegetable cellulose, maltodextrin, and medium chain triglycerides. If you’re severely allergic to some ingredients, please keep in mind that this product is manufactured and packaged in a facility that may also process milk, soy, wheat, egg, peanuts, tree nuts, fish, and crustacean shellfish. So although the capsules don’t contain these allergens, they may be exposed to them at some point in time. For a 1-month supply of Number One Nutrition Advanced Probiotic (60 veggie capsules), the cost is a whopping $39.99! This comes in at $1.33 a day. Compared to other probiotics, this is incredibly expensive. I have seen this product on sale for $21.99 on their website, but it just depends on if you can catch the sale or not. At almost $40 a bottle, I’m not sure if I would readily purchase this product again, even though I do think that it has good qualities. By no means am I under 18 years old (unfortunately), but I was a little wary that this probiotic was only safe for individuals 18 and above. I was worried I would see some intense side effects, but thankfully I didn’t see any adverse effects. I’m always happy when I don’t have to experience stomachaches in the first few days, so that’s a definite plus. One great thing about Number One Nutrition is their guarantee and return policy. They have a 100% satisfaction guarantee and “hassle-free returns”. If you don’t see results, then you can get your money back. This seems like a fair, risk-free way to test out their product and hopefully see some positive results. To buy Number One Nutrition Advanced Probiotic, click here.